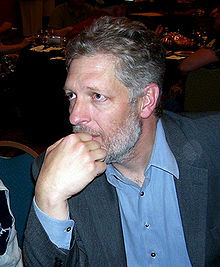 Clarence J. Clancy Brown III is an American actor and voice actor. He is known for his roles in live action as The Kurgan in the cult classic film Highlander, Byron Hadley in the award-winning The Shawshank Redemption, Brother Justin Crowe in HBO's critically acclaimed Carnivle, Career Sergeant Zim in Starship Troopers and the killer Steve in Shoot to Kill. Brown also works extensively as a voice actor in animated films and TV series, notably portraying Mr. Eugene H. Krabs in the hit animated series SpongeBob SquarePants and having portrayed Lex Luthor for longer and in more appearances than any other actor, voicing him throughout the DC animated universe and the film Superman Batman: Public Enemies. He also voiced Raiden in Mortal Kombat: Defenders of the Realm, Gorrath in Megas XLR, Captain Black and Ratso in Jackie Chan Adventures, Vice-Principal Pangborn in All Grown Up, Otto in Super Robot Monkey Team Hyperforce Go, Destro in G.I. Joe: Renegades and Savage Opress in Star Wars: The Clone Wars.